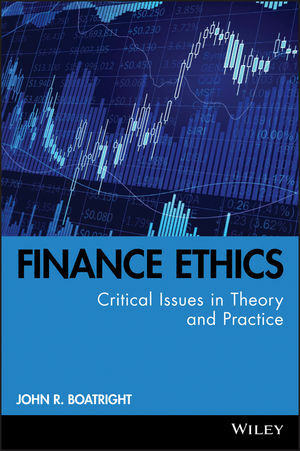 Compiled by volume editor John Boatright, Finance Ethics consists of contributions from scholars from many different finance disciplines. It covers key issues in financial markets, financial services, financial management, and finance theory, and includes chapters on market regulation, due diligence, reputational risk, insider trading, derivative contracts, hedge funds, mutual and pension funds, insurance, socially responsible investing, microfinance, earnings management, risk management, bankruptcy, executive compensation, hostile takeovers, and boards of directors. Ethics in Finance skillfully explains the need for ethics in the personal conduct of finance professionals and the operation of financial markets and institutions. 1. Ethics in Finance (John R. Boatright). 2. Ethical Implications of Finance (Robert W. Kolb). 3. Behavioral Assumptions of Finance (John Dobson). 4. Efficiency and Rationality (Nien-hê Hsieh). 5. Risk, Return, and Financial Due Diligence (Christopher L. Culp and J. B. Heaton). 6. Reputational Risk (Ingo Walter). 7. Agency Theory (Joseph Heath). 8. Financial Theory of the Firm (Wayne Norman). 9. Fairness in Markets (Eugene Heath). 10. Market Regulation (Edward Soule). 11. Insider Trading (Peter-Jan Engelen and Luc Van Liedekerke). 12. Derivative Contracts: Futures, Options, and Swaps (James A. Overdahl). 13. Hedge Funds (Thomas Donaldson). 14. Sovereign Wealth Funds (Colleen Baker). 15. Marketing of Financial Services (George G. Brenkert). 16. Financial Codes of Ethics (Julie A. Ragatz and Ronald F. Duska). 17. Banking (Christopher J. Cowton). 18. Mutual Funds (D. Bruce Johnsen). 19. Pension Funds (David Hess). 20. Insurance (Ronald F. Duska and Julie A. Ragatz). 21. Socially Responsible Investing (Céline Louche and Steven Lydenberg). 23. Shareholder Wealth Maximization (Duane Windsor). 24. Earnings Management (Leonard J. Brooks). 25. Investor Relations (Cynthia Clark Williams and Lori Verstegen Ryan). 26. Risk Management (Peter C. Young). 27. Bankruptcy (Ben S. Branch and Jennifer S. Taub). 28. Acquisitions, Mergers, and Takeovers (Anthony F. Buono and Roy A. Wiggins III). 29. Executive Compensation (John J. McCall). 30. Boards of Directors (Dan R. Dalton and Catherine M. Dalton). Provides a comprehensive overview of the ethical issues in finance. The discussion of ethical issues is framed in terms familiar to people in finance. Focus is on practical issues that confront people in all areas of finance and that arise in the developing government and industry regulation. Among the many sources are court cases, regulatory actions, and industry reports. The book contains an in-depth examination of the firm as a nexus of contracts and shareholder wealth maximization as the objective of the firm.